Vita Needle standard stock material is welded and drawn, seamless in appearance. Standard fractional, metric and hypodermic gauges are stocked in 304 stainless steel and many are also in 316 stainless steel. Custom sizes can be quoted to request. Welded and drawn tubing begins with flat strip stock, which is T.I.G. welded into a tube and then drawn through a series of dies to reach the final size. All stock tubing smaller than ½” outer diameter is welded and drawn unless otherwise quoted. Tubing can be manufactured from 304, 316, 321 and 347 stainless steel as well as additional alloys. “L-grade” (low carbon), Domestic and DFARS compliant raw material can also be selected for tubing. Welded and drawn tubing offers improved concentricity, and tighter tolerances compared to seamless tubing, and temper ranging from annealed to full hard. The process begins with strip stock that is run through a series of rollers that form the flat strip into a round tube. The seam is T.I.G. welded within an inert atmosphere weld box, which offers improved cleanliness and reduced surface oxidation due to reduced impurities. Tooling is inserted into the ID of the tube with lubricating oil and is then drawn through a series of dies. This process is considered “cold working”, and will harden the material as well as improve the ID finish as the tube is drawn down to size. Hardness varies from lot to lot and between gauges as material with a larger OD or thicker wall will not be worked as much as gauges that require additional draws. 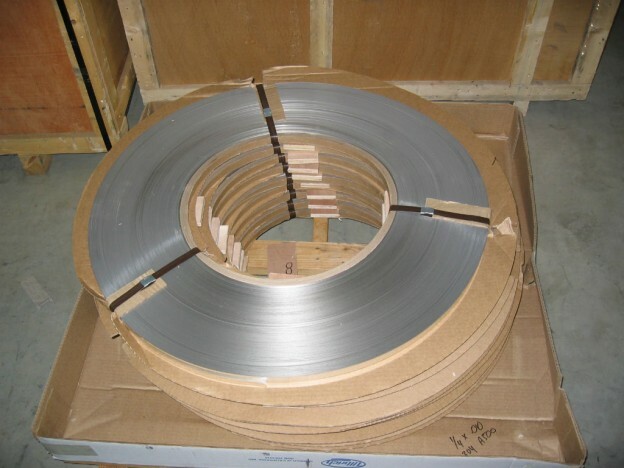 Once material is drawn to the final size, material is taken off the coil, straightened, and cut into straight lengths. Material can also be annealed prior to or after straightening if required by customer. Material stocked at Vita Needle is in 10’ R/L (random lengths) that are generally cut into 5’ R/L ± 3” for customer shipment via UPS of FedEx shipping, as longer lengths must be shipped via freight. For more information refer to our Welded and Drawn Tubing page. Please call or email for pricing and lead-time on our standard stock or to request a quotation for custom dimensions.